A fire-breathing "Dragon" flew atop a "Falcon" that was granted its powers by "Merlin." Though the scene could be out of a fantasy novel, it is also literally true. 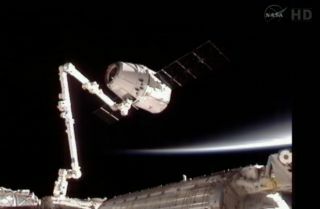 On Friday (May 25), a robotic spacecraft called Dragon docked at the International Space Station three days after launching on a Falcon 9 rocket driven by nine Merlin engines. The mission is a test flight for commercial company SpaceX (Space Exploration Technologies Corp.), which became the first company ever to send a private spaceship to the space station. Though many pieces of SpaceX hardware have fantastical monikers, company spokeswoman Kirstin Brost Grantham said they weren't all planned to fit a theme. "They are named independently, the rule is names must be cool," Grantham told SPACE.com. Falcon 9 and its smaller sibling booster Falcon 1 are named in honor of the Millennium Falcon spacecraft flown by Han Solo in the sci-fi classic film "Star Wars," Musk has said. The rocket's Merlin engines may be allusions to the wizard Merlin of Arthurian legend. And those aren't the only whimsical names in SpaceX lore. A navigation sensor called DragonEye was tested in 2009 on the space shuttle Endeavour's STS-127 mission, when the shuttle used it while approaching the International Space Station. The Dragon capsule currently in orbit has 18 thrusters called Draco (after the constellation for Dragon) for maneuvering in space — a name that happens to be shared by one of the antagonists in J.K. Rowling's "Harry Potter" novel series. The spacecraft also uses a communications system called CUCU (pronounced "cuckoo") that stands for COTS Ultra High Frequency Communication Unit (COTS, or Commercial Orbital Transportation Services, is the name of the NASA program sponsoring Dragon's test flight). An engine used to power the upper stage of Falcon 1 rockets is called Kestrel, which is the name of several species of birds in the falcon genus. The spirit of SpaceX names so far appears to differ significantly from the monikers bestowed to spacecraft by NASA. While SpaceX is flying Falcons and Dragons, the U.S. space agency is working on a new rocket called the Space Launch System(SLS) and a capsule called the Multi-Purpose Crew Vehicle (MPCV), though this spacecraft is also known by the more user-friendly name of Orion. The giant government-built space station goes by the straightforward name International Space Station, while our country's last spacecraft bore the only slightly more creative title space shuttle. These naming trends may be just one more difference on the long list of ways that commercial spaceflight differs from the modus operandi of government space agencies. SpaceX has grand aims to eventually build more rockets and spacecraft to explore the solar system beyond Earth orbit. Who knows what they'll be called?